Click to download this fun invitation. Birthday party invitations come in a number of styles and designs. Because 50 is a commonly celebrated benchmark birthday, there are plenty of invite choices. Download one of the free printable invitations available here, or use the resources provided to search for different styles. Click to download this elegant invitation. Whether you are hosting an extravagant gala or a casual get-together in honor of the birthday man or woman, a free printable might be exactly what you need. 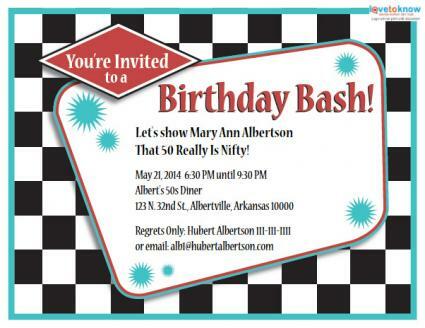 Surprise party: If you're hosting a surprise party, Zazzle has a postcard design that will work for your needs. The black card features gold lettering and you can enter custom text on the front and back, as well as change the images. Order in any quantity you want for $1.10 each. Photo personalization: What adds a true personal touch better than an actual photo of the birthday honoree? 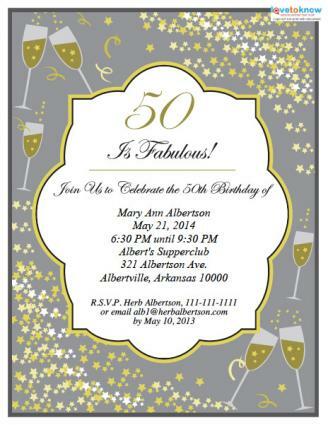 Invitation Consultants offers several designs designed to feature a portrait of the birthday man or woman who has reached the 50th birthday landmark. Some styles have space for just a current image while others allow you to add photos from years' past as well. Packages of 10 cost $29. Fun style for women: The Chic Gal Disco design from Paper Style is a fun way to invite guests to a retro-theme party reminiscent of the days of disco. The disco ball art element adds a retro touch and gives guests a preview of what they can expect the party's music and décor theme to "revolve" around. Packages of 10 invitations cost $25. Floral design: Evite.com has a 50th birthday celebration invitation with a floral background design. Customize the invitation online quickly and easily to send to guests at no cost. Candles: 123Greetings.com offers an customizable evite featuring a 5 and a 0 displayed as lit candles that can also be sent at no cost. You can include music with the card, or turn the sound off. No matter what type of invitation you use, the invitees will be excited that you've asked them to join in the celebration. Select a design that matches the overall theme of the 50th birthday party you are throwing and make sure the details are correct before distributing to guests.